Dark Star Black & Green Gothic Satin Roses Lace Hi Low Skirt [DS/SK/7238G] - $89.99 : Mystic Crypt, the most unique, hard to find items at ghoulishly great prices! 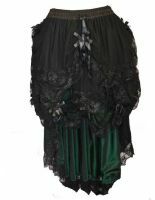 Dark Star Black & Green Gothic Satin Roses Gothic Hi Low Skirt. Quite the most breathtaking Gothic skirt we have ever seen! This is a three layer gothic skirt. Top layer is made of gathered black lace with black roses. The second layer is a short length gathered coloured synthetic silk with black lace trim. The third layer is long at the back with black lace trim and short at the front (hi low skirt) elasticated waist with drawstring/ribbon to fit a multitude of sizes. The underskirt is made from soft satin with stiffened net tulle over the top, then swags of ultra soft fine mesh edged with lace and decorated with organza roses and black satin ribbon. 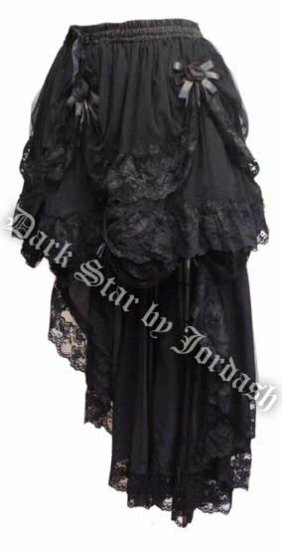 Would be perfect as part of a Gothic bridal outfit and would look gorgeous with a tight fitting corset to accentuate the shape of the skirt. This skirt has an elastic waistband as well as a satin cord to cinch in and out the waist. Please read measurements carefully! There is a slight green tint to the lace in some lighting. *Alternate pic below shows the side of skirt in *Black* for reference.